Research indicates that most people change jobs within 3 years, and more often than not it’s to a similar role or within the same industry. But if you are thinking of making a complete career change and have some serious doubts – you are not alone. Having doubts about the lack of experience, skills or qualifications you might need in order to change careers is what puts most people off. Finding the time to learn a new skill whilst working full time is also a worry, but there are lots of ways for you to plan your next move. The first hurdle you’ll run into is the lack of preparation and the confidence to begin that preparation for a possible change. You will never know if your dream job is attainable unless you face up to the fact that you CAN take the next step – and this is why mental preparation will be the key to success. The mere thought of changing careers whilst trying to remain upbeat in your current job can be very stressful, but it’s the end goal that you need to focus on rather than your present situation. This video was embedded in Richard Branson’s LinkedIn article, ‘How to Find a Fulfilling Career‘ (November 28, 2013), from which the above quote was also taken. The only way to find out if you are able to change careers is to do as much research as possible. What skills are required? Will you have to take a course? Will you need to start at an entry level position? Propects job profiles are a great place to start when researching a new role that you’re interested in. However, don’t be too hasty to jump ship until you have another position lined up. The worst thing you can do is quit your current job and then begin to see what’s out there. Instead, why not focus on what it is you actually want to do, who you could work for, and what would be required for a successful transition. When can I leave my current position – work my notice period? Can I take a course whilst working at my current role? Can I take a part time job whilst training for my new career? What are the financial ramifications of leaving my current job? You have to ensure you have a clear, focused plan of action that will allow things to go as smoothly as possible. Remember, plans can change and things can go wrong, but you’ll be in a much better position to adjust if you have your sites firmly focused on your goals. Which skills, experience and qualifications are transferable? You’d be surprised at how much your experience is valued by an employer, even if it’s in a different career. Make a list of all the things you’ve learned and the knowledge and skills you’ve gained over the years, and then attempt to match them to your new chosen career path. Communication, problem solving, customer complaints handling, sales experience, IT skills, and so on – are all extremely important skills that will transfer to almost any role, no matter how different your new chosen career path may seem. Most of these skills cannot be taught or learned in a University or college, and are often placed at the top of the list by an employer who is looking for someone to take on a new challenge. Your CV can then be tailored and custom written to show the new employer how your skills can transfer over to the new role. Highlight this information and make it clear to the hiring manager so they don’t have to hunt around for these key selling points. For more information on why you should tailor your CV to the role – click here and scroll past the CV template for our advice. Before you write your new tailored CV it’s important to ensure the template you use is the very best. But why use a CV template in the first place? Choosing the right CV template not only saves you a lot of time, but it also looks great and up to date. If your current CV is the same one you’ve been using for years, then now is the perfect time for a makeover. Your CV is the first thing a new employer is going to see, and the layout and presentation is vital if you want to gain an interview. 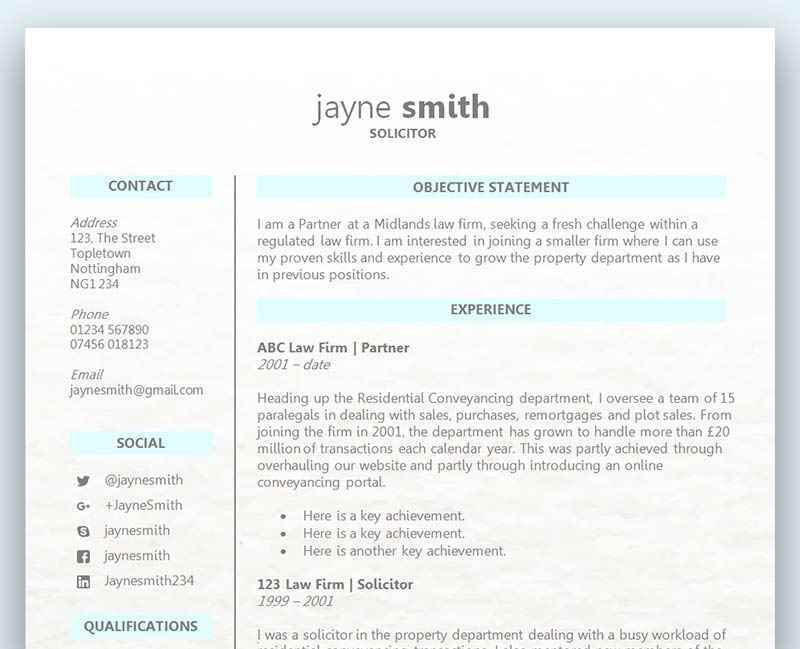 Rather than spend hours trying to create the relevant sections and fiddling around in Word with the layout, your time could be spent focusing on the actual content – and this is why using a quality CV template is really important. Choose a free CV template here. When the day finally comes and you make it to the interview stage, be passionate and confident about everything you have to offer the new employer. Although you may have some doubts as to how it will be possible to make a complete career change, you’ve made it this far so why not give it everything you have! Clearly the hiring manager has seen something they like from reading your CV, so you need to grab the opportunity by the scruff of the neck and make every second count. Show lots of passion for the new career and don’t let your lack of experience hold you back. A confident, dynamic and passionate individual can be just as likely to get a role no matter what experience and skills they may have. An employer is looking for someone who wants to join their company for the right reasons, and someone who shines in an interview will always give themselves the very best chance of success. Nerves can play a big part in an interview, so here’s a great article on ‘How to get over those job interview nerves’. If you would also like more information on preparing for an interview, please read our guidance on ‘Job interview preparation’. This is where your preparation and research will save the day, as you will have already looked into what is required, and hopefully you will have achieved your goals at this stage. For instance, look at your list of transferable skills and review your tailored CV. Both of these will indicate the things you are able to transfer over to the new career, as well as the courses and training you’ve undertaken to make the career change. Memorise the important aspects so your answers flow naturally when being asked these difficult questions. You are obviously up against other candidates with years of experience, so what sets you apart from your competition? Focus on what you do know and have, rather than what you don’t. Could you be a CNA?